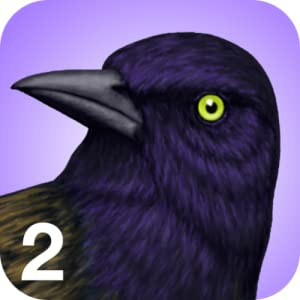 iBird Lite 2 is a great bird reference app for ornithological fans. It contains entries on 30 birds and includes 50 illustrations, 127 photos, 58 audio recordings of bird calls, 30 range maps, and thousands of facts to help you identify some of the most popular birds in North America. Each drawing is hand drawn and full sized, with perching and flight views. Multiple professional photographs show plumage, sexes, and seasons. Zoom and pinch the portraits for viewing fine detail. You’ll have access to extensive behavior and habitat information, including diet, egg color, band codes, and much more. If you want to know even more, you’ll be linked to Flickr photos and detailed Wiki pages for each bird. You’ll also get an extensive glossary of bird terms and definitions. Note: No Internet connection is required to use the app. However, the large database of bird illustrations, photos, and sounds must first be downloaded from the iBird server, so a fast WIFI connection is required. Please use iBird Lite in the field responsibly. The American Birding Association’s Code of Ethics, particularly section 1(b), is suggested reading.